It has been a while since I shared any of my wire work. I'm extremely pleased how some of my new pieces are turning out. So for this week I thought I would share some photos (and maybe a video or two) from the newest ones. I'm really in love with these blue labs now. 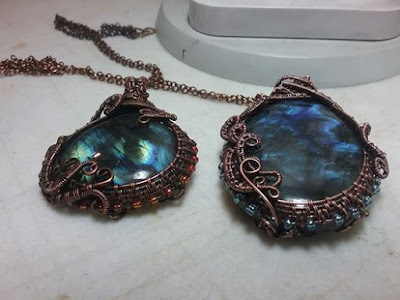 Here's some info I found about Copper/Labradorite on the web. 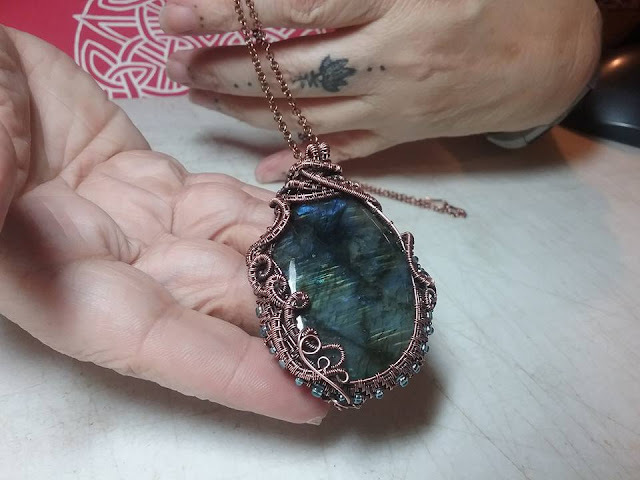 This labradorite pendant is so impressive and amazing. It is modern and elegant. Blue flashy labradorite is eye-catching in a classy way. A stone of transformation, Labradorite is a useful companion through change, imparting strength and perseverance. It balances and protects the aura, raises consciousness and grounds spiritual energies. Excellent for strengthening intuition - promoting psychic abilities. Also just plain drop dead gorgeous of a stone! Copper is said to promote love, sensuality, friendship, positive relationships of any kind, negotiations and peace. Healing work, fertility spells, prosperity spells, and spells to attract love. Copper is 100% recyclable without loss of quality. There is anecdotal evidence that copper can be used in the treatment of wounds and skin diseases, as well as internal diseases, anemia, cancer, rheumatoid arthritis and heart disease. It can also help improve the circulation of blood, increasing energy and detoxifying the body. It is primarily said to benefit the Root and Sacral Chakras, but may also benefit the Heart Chakra. You can find my work on Etsy and Amazon Handmade.